Red Rock Ranch is an amazing new horse series book for girls of all ages. I predict Heartland fans are going to love this series! Lucy Rose is a 16-year old girl working at Red Rock Ranch for the summer. A cute cowboy catches her eye but pretty soon she’s immersed in trying to help save a black gelding that doesn’t want anything to do with anyone. The characters--as well as the horses and their interactions with them--are realistic, which I liked. It’s a fun young adult novel with all the elements horsecrazy girls are sure to love. I am giving away a signed autographed copy of Lucy’s Chance, the first book in the series, to one lucky reader. So be sure to enter on our competition page! Basically, since I was born! As a little girl, my bedroom was stacked with My Little Ponies and Breyer Horses, but I didn't get my first significant experience with horses until I was ten. That summer my parents were looking for something to keep me busy and signed me up for a summer horse camp . . . I never looked back! I was obsessed from the start. I started taking lessons and then began working at that same ranch when I was twelve - scooping poop, feeding horses, grooming, and (eventually) leading trail rides. And, I finally wore my parents down and got my first horse, Austie, when I was thirteen. Austie and that ranch really shaped my childhood. I've always been a reader and English/literature classes were my favorite part of school! Through middle school I devoured "The Thoroughbred Series" by Joanna Campbell and I always wanted to write something that would speak to the same type of audience - the horse/crazy girl! A few years back, I quit my corporate sales job and (while I was job hunting for my next sales "adventure") I figured it was as good of time as any to follow-up on that goal and start writing. 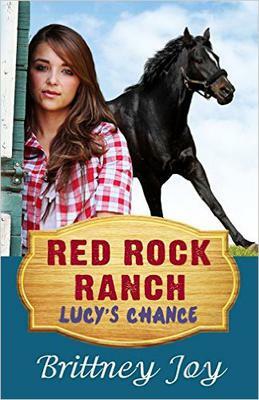 Before I started my new job, I had the first draft of "Lucy's Chance" (Red Rock Ranch, book 1) complete. Read lots! I try to read a few books a month - of all types of genres. By reading, you learn what you enjoy reading in other authors' works (and what you don't like) and this ultimately helps with your writing. Also, keep notebooks everywhere. You never know when a plot idea or character inspiration or a snappy line will pop in your head. There is inspiration everywhere -- that's why I keep a notebook in my purse, briefcase, office, and next to my bed. I sure do! I've never gone without having a horse since I was blessed with my first horse at thirteen. And, in fact, she even went to college with me. Currently, I have two horses - Cheli and Stella and they live in my backyard (which is the best!). Stella is a 13 yr old bay tobiano paint mare that I've had since she was two. She was my western pleasure show horse and also moved with me across the country - from Minnesota to Oregon (where I live now). She's my bomb-proof-diva. While I don't show her any longer, she is the horse I throw my non-horsie friends on for trail rides. Otherwise, she just gets pampered and loved on and fed lots of carrots. Cheli is a 13 yr old dark dapple bay Friesian/Thoroughbred/Paint gelding and he is my big, beautiful teddy bear. Cheli and I compete in western dressage events and also love to trail ride!